A natural component in teak trees, teak oil serves a number of purposes. The oil's most valuable characteristic is that of water- and weather-proofing. Teak-oil treated wood can withstand exposure to water, sun, wind, rain and snow much longer than untreated wood. Teak oil lends a rich color and patina to treated wood and is often used on boats and outdoor furniture. Several other materials offer similar protective and aesthetic qualities to those of teak oil. 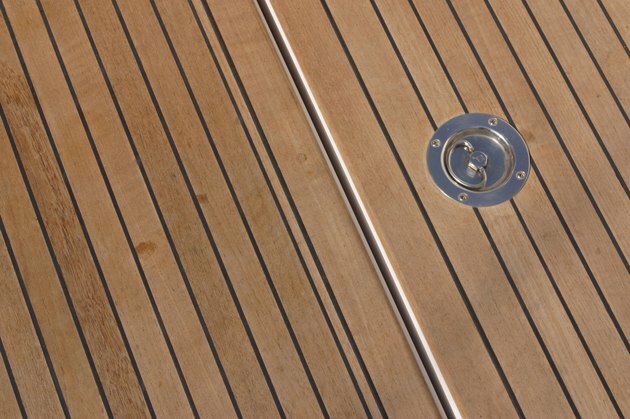 Teak oil is often used to finish and protect outdoor furniture and nautical brightwork. Like teak oil, tung oil comes from trees. This natural substance is found in Aleurites trees, a genus indigenous to China. Tung oil has long been used as a component in mortar, caulk, ink, paints, waterproof finishes and varnishes. In fact, according to Wayne's Word, an online resource on natural history, many products labeled and sold as teak oil are made from refined tung oil. Like teak oil, tung oil dries into a hard, non-tacky, glossy finish that both enhances wood's appearance and increases its resistance to environmental elements such as sun and water. Linseed oil can replace teak oil. Like teak oil, linseed is plant-based and offers a measure of weather resistance to treated wood. Unlike teak oil, linseed oil tends to darken wood and doesn't resist water for extended periods. According to the University of Rhode Island, naturally sourced oils such as olive and almond can be used to polish wood. Unlike teak oil, however, these oils should only be used on interior wood because they don't offer water or weather resistance. When mixed with olive oil and a bit of lemon juice, mineral oil also makes an effective -- and eco-friendly -- wood polish for indoor furniture. Unlike teak oil, sealants don't "feed" wood, but they do create a glossy, smooth finish that repels dirt, water and damage from the weather. Sealers also prevent the loss of oils and resins that naturally exist in wood. Boat expert and author Don Casey notes that sealers only adhere to oil-free surfaces, and recommends wood must be cleaned with a strong, fast-drying solvent, such as acetone, before applying sealer. Once wood is clean and dry, brush sealant on just like you would teak oil. Finished sealant needs retouching every two to three months. Varnish offers a long-lasting alternative that, like teak oil, repels water and protects against the elements. For outdoor wood and furniture, choose a varnish that blocks or reflects UV rays. Brands that don't contain UV protectants could cause wood to darken over time. Temple University's boat maintenance site recommends sealing wood with mineral and maple oil before applying at least six thin coats of varnish. To achieve a smooth, glossy finish, varnish should be applied to well-sanded wood on dry, warm, sunny days. Dried varnish can be sanded and retouched as needed. Depending on brand and environmental conditions, varnish can last for several years.